When are consumers more likely to their Christmas shopping in the UK, September 2013. 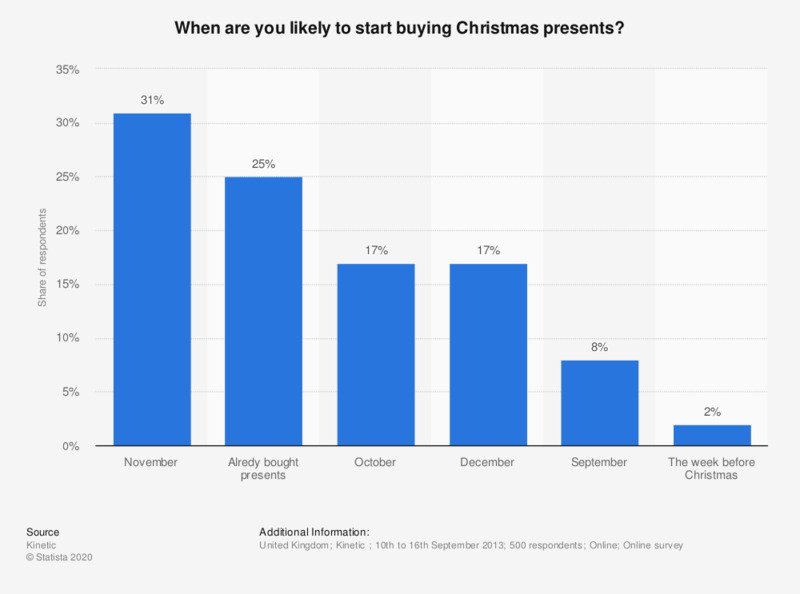 The majority of the consumers in the UK plan to do their Christmas shopping in November. One in four had already bought presents while 2 percent of the consumers planed to go shopping in December or the week before Christmas. With changes in technology, this has lead the way for people to shop differently. Now, more people are Christmas shopping online than ever before, with 42 percent of people now stating that they do some shopping online. The mobile device is a key tool for Christmas shopping now, with toy and beauty products being more sought after, where as books and e-books have dipped in sales. Many people have decided to use this technology for Christmas shopping mainly due to the amount of people who want to shop in store. 67.75 percent of people say the crowds of people put them off, and another 12 percent feel that the bags are too heavy to carry when doing a full Christmas shop.